Over the last five years, large, predatory Humboldt squid have moved north from equatorial waters and invaded the sea off Central California, where they may be decimating populations of Pacific hake, an important commercial fish. Ironically, these squid may have benefited from the decline of large tuna and billfish in the Equatorial Pacific, which previously preyed upon and competed with the Humboldt squid for food. This biological shift is documented in an article by postdoctoral scholar Louis Zeidberg of Stanford University and senior scientist Bruce Robison of the Monterey Bay Aquarium Research Institute in the July 31, 2007 edition of the Proceedings of the National Academy of Sciences. Humboldt squid (Dosidicus gigas) hunt in large numbers along the coasts of both North and South America, from Chile to Baja California. They have occasionally been spotted as far north as San Francisco, but never before in large numbers or over long periods of time. In recent years, mass strandings of Humboldt squid on Southern California beaches have led to speculation that the squid might be expanding their range. This study provides the first scientific records to prove that assertion. To study changes in the abundance of Humboldt squid in Monterey Bay over time, the authors reviewed video and data from surveys of marine life carried out by Robison and his colleagues at the Monterey Bay Aquarium Research Institute (MBARI). Since 1989, Robison has used MBARI’s remotely operated vehicles (ROVs) Ventana and Tiburon to videotape and count the number of midwater animals observed at specific depths in Monterey Bay. The resulting data are stored in a searchable database that allows scientists to determine exactly when and where each animal was seen. Searching through Robison’s survey data, Zeidberg found no observations of Humboldt Squid from 1989 to 1997. During 1997, however, large numbers of Humboldt squid were seen for a year or two after a strong El Niño event brought warm water northward along the coast and into Monterey Bay. 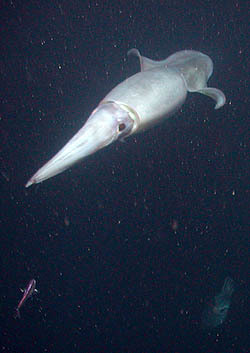 From 1999 until 2002, just a few Humboldt squid were seen during ROV dives. In 2002, however, large numbers of squid appeared after a mild El Niño event, and they have been abundant ever since. The researchers speculate that, during El Niño years, currents from the south help carry Humboldt squid northward to new feeding areas. However, Humboldt squid are believed to live for only a year or two, and El Niño events occur every three to seven years on the average. Thus, El Niño-related currents alone could not maintain a large population of Humboldt squid in this area. This may explain why the squid that appeared in 1997 disappeared within a year or two—they came and they ate, but they did not reproduce locally and eventually died out. Since 2002, however, the authors suggest that Humboldt squid have been both feeding and reproducing off Central California. Although Humboldt squid have historically been found in warm-water areas, they are very adaptable. Robison’s observations show that in Monterey Bay they frequently hunt thousands of feet below the sea surface, where the water is quite cold (less than eight degrees Centigrade). Thus, their colonization of Central California waters is not simply a response to a localized warming of the ocean. Zeidberg and Robison suggest that Humboldt squid populations may be growing and expanding northward due to a decrease in the number of predators and competitors in their home range (the Equatorial Pacific). Chief among these predators and competitors are large tunas and billfish, whose numbers have dropped precipitously in the Eastern Pacific over the last few decades. 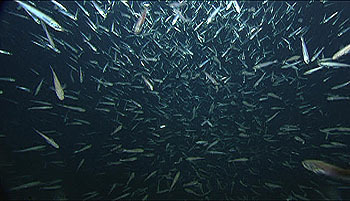 MBARI’s remotely operated vehicle Ventana captured this image on its video cameras as it passed through this dense school of hake in Monterey Bay. Video from ROV dives shows that Humboldt squid off the Central Coast have found plenty to eat in their new home. 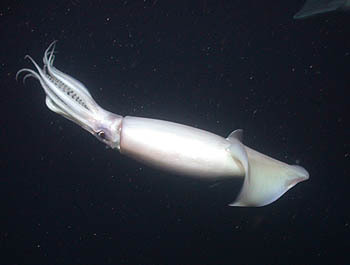 According to Zeidberg, “In the deep water offshore of California, Humboldt squid can forage on small lanternfishes, as they do in the tropics. 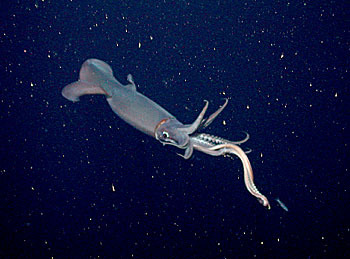 However, when the squid migrate onto California’s productive continental-shelf areas, their adaptable hunting strategies allow them to prey upon commercially important fishery species like hake and anchovy.” In fact, Robison’s survey data showed that within a month after populations of Humboldt squid increased in Monterey Bay, the number of hake dropped dramatically. The Humboldt squid’s apparent preference for hake makes their northward expansion more than just an ecological case study. 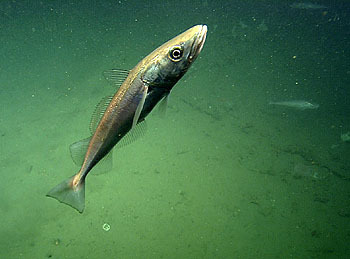 Although the hake fishery in Monterey Bay is not large, this species (also known as Pacific whiting) is presently the most important commercial groundfish caught off western North America. (Most hake is caught and processed offshore of the Pacific Northwest by factory ships that grind up the fish to make imitation crab and other minced-fish products.) In the last few years, Humboldt squid have also been expanding their range southward along the coast of South America, and may be threatening hake fisheries there as well. Over the last five or ten years, Humboldt squid have expanded both north and south of their “home turf.” A few have been seen as far north as Canada and the Gulf of Alaska. This expansion, if sustained, could have far-reaching effects on West Coast fisheries and marine ecosystems. Zeidberg and Robison’s paper shows how sustained scientific monitoring efforts in the marine environment can help document such important biological shifts that might otherwise be missed. L. D. Zeidberg and B. H. Robison, Invasive range expansion by the Humboldt squid, Dosidicus gigas, in the eastern North Pacific. 2007. Proceedings of the National Academy of Sciences Vol. 104 #31 pp12948-12950 (July 31, 2007). Note: These images may not be copied, reprinted, or used without explicit permission from MBARI. Members of the media needing higher-resolution versions should contact Kim Fulton-Bennett, kfb@mbari.org, 831-775-1835. 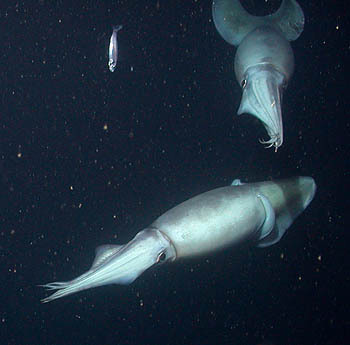 This photograph shows a pair of Humboldt squid hunting in Monterey Bay. Humboldt squid are often attracted to the bright lights of MBARI’s remotely operated vehicles, and follow the robot submarines as they descend through through the water column. This photograph of a Humboldt squid shows its feeding tentacles reaching out to capture a small fish. Hake often form large schools, but this individual was photographed by ROV Tiburon off the coast of Big Sur.